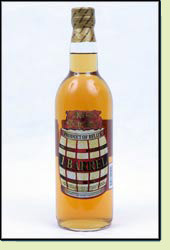 Andy: This rum has the aroma of cinnamon or prailines, but the aroma is very deceiving. It is harsh and bitter. Horrible. I can still feel it sitting in my throat. Not good. After mixing it with Diet Coke, it isn’t that bad. You can definitely taste the cooked sugar. Horrible straight, decent mixed with Diet Coke. Adrian: One Barrel has a strong molasses smell, but kind of tastes like coffee. It is a little disappointing though. It has a bitter flavor, not rich or really flavorful. After mixing it with Diet Coke, it kind of tastes like root beer.